If you’re building a SaaS application, you probably already have the notion of tenancy built in your data model. Typically, most information relates to tenants / customers / accounts and your database tables capture this natural relation. With smaller amounts of data (10s of GB), it’s easy to throw more hardware at the problem and scale up your database. As these tables grow however, you need to think about ways to scale your multi-tenant database across dozens or hundreds of machines. The option you pick has implications on scalability, how you handle data that varies across tenants, isolation, and ease-of-maintenance. And these implications have been discussed in detail across many StackOverflow questions and database articles. So, what is the best solution? To expand on this further, if you’re planning to have 5 or 50 tenants in your B2B application, and your database is running into scalability issues, then you can create and maintain a separate database for each tenant. If however you plan to have thousands of tenants, then sharding your tables on a tenant_id/account_id column will help you scale in a much better way. Resource pooling (reduced cost): If you create a separate database for each tenant, then you need to allocate resources to that database. Further, databases usually make assumptions about resources available to them–for example, PostgreSQL has shared_buffers, makes good use of the operating system cache, comes with connection count settings, runs processes in the background, and writes logs and data to disk. If you’re running 50 of these databases on a few physical machines, then resource pooling becomes tricky even with today’s virtualization tech. If you have a distributed database that manages all tenants, then you’re using your database for what it’s designed to do. You could shard your tables on tenant_id and easily support 1000s or tens of thousands of tenants. 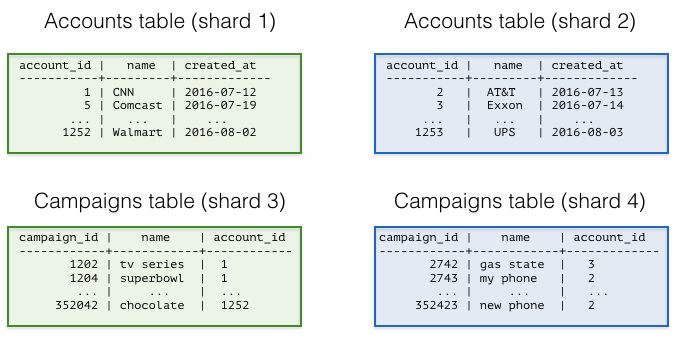 Google’s F1 paper is a good example that demonstrates a multi-tenant database that scales this way. The paper talks about technical challenges associated with scaling out the Google AdWords platform; and at its core describes a multi-tenant database. The F1 paper also highlights how best to model data to support many tenants/customers in a distributed database. 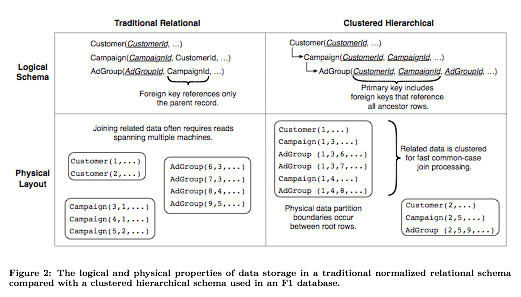 The data model on the left-hand side follows the relational database model and uses foreign key constraints to ensure data integrity in the database. This strict relational model introduces certain drawbacks in a distributed environment however. In particular, most transactions and joins you perform on your database, and constraints you’d like to enforce across your tables, have a customer/tenant dimension to them. If you shard your tables on their primary key column (in the relational model), then most distributed transactions, joins, and constraints become expensive. Network and machine failures further add to this cost. The diagram on the right-hand side proposes the hierarchical database model. This model is the one used by F1 and resolves the previously mentioned issues. In its simplest form, you add a customer_id/tenant_id column to your tables and shard them on customer_id. This ensures that data from the same customer gets colocated together – co-location dramatically reduces the cost associated with distributed transactions, joins, and foreign key constraints. Ease of maintenance: Another challenge associated with supporting 100-100K tenants is schema changes (Alter Table) and index creations (Create Index). As your application grows, you will iterate on your database model and make improvements. If you’re following an architecture where each tenant lives in a separate database, then you need to implement an infrastructure that ensures that each schema change either succeeds across all tenants or gets eventually rolled back. For example, what happens when you changed the schema for 5,000 of 10K tenants and observed a failure? How do you handle that? When you shard your tables for multi-tenancy, then you’re having your database do the work for you. The database will either ensure that an Alter Table goes through across all shards, or it will roll it back. What about data that varies across tenants? Another challenge with scaling to thousands of tenants relates to handling data that varies across tenants. Your multi-tenant application will naturally include a standard database setup with default tables, fields, queries, and relationships that are appropriate to your solution. But different tenants/organizations may have their own unique needs that a rigid, inextensible default data model won’t be able to address. For example, one organization may need to track their stores in the US through their zip codes. Another customer in Europe might not care about US zip codes, but may be interested to keep tax ratios for each store. This used to be an area where having a tenant per database offered the most flexibility, at the cost of extra maintenance work from the developer(s). You could create separate tables or columns per tenant in each database, and manage those differences across time. If then you wanted to scale your infrastructure to thousands of tenants, you’d create a huge table with many string columns (Value0, Value1, … Value500). Probably, the best known example of this model is Salesforce’s multi-tenant architecture. In this database model, your tables have a preset collection of custom columns, labeled in this image as V1, V2, and V3. Dates and Numbers are stored as strings in a format such that they can be converted to their native types. When you’re storing data associated with a particular tenant, you can then use these custom columns and tailor them to each tenant’s special needs. Fortunately, designing your database to account for “flexible” columns became significantly easier with the introduction of semi-structured data types. PostgreSQL has a rich set of semi-structured data types that include hstore, json, and jsonb. You can now represent the previous database schema by simply declaring a jsonb column and scale to thousands of tenants. Of course, these aren’t the only design criteria and questions to be aware of. If you shard your database tables, how do you handle isolation or integrate with ORM libraries? What happens if you have a table that you can’t easily add a tenant_id column? In this article, we focused on building multi-tenant databases with scaling as the primary consideration in mind; and skipped over certain points. If you’re looking to learn more about designing multi-tenant databases, see Multi-tenant Applications. The good news is, databases have advanced quite a bit in the past ten years in accommodating SaaS applications at scale. What was once only available to the likes of Google and Salesforce with significant engineering effort, is now becoming accessible to everyone with open-source technologies such as PostgreSQL and Citus.